jeffsbuzz: Why is the study of social science so critical to our future? This is a question which has come up a number of times over the past few weeks , firstly at a meeting at the London School of Economics, then with a colleague at Goldman Sachs and more recently at a meeting with a Cambridge Experimental Psychologist, in the Department of Engineering. Conversations with these people caused me to think about my own work with social scientists over the last decade. Had the interactions been critical to my thinking? The answer is yes, a resounding yes, but why? 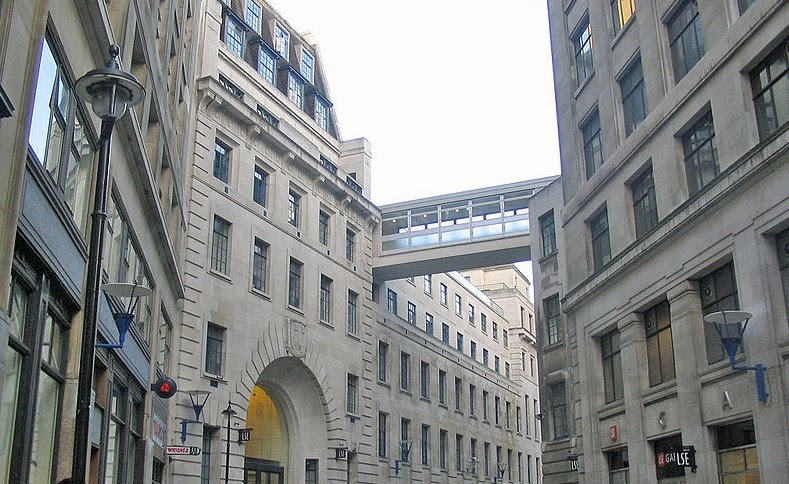 My first real, and important, experience of working with a social scientist was in 2004 when I was introduced to a young social anthropologist, Xiaoxiao Yan, who had decided that her PhD research would focus on the impact of Broadband communications on the UK and China. Xiaoxiao had a longstanding interest in the relationship between culture and technology and had been investigating the impact of broadband technology since 2002. 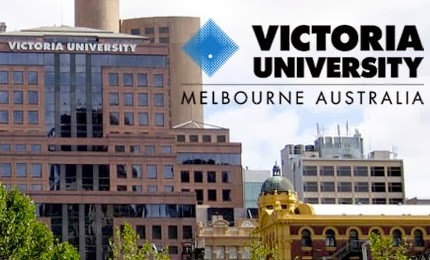 Her supervisor, Alan Macfarlane, suggested that I might be interested in supporting her research and explained that her field work in China could provide me with valuable insight; the study a small start-up company in Beijing. She told me that her research would focus on how the company, in its very early stages, would build an on-line customer base for its product by developing a trusted relationship with its customers through chinese bulletin boards and IM. (The company sold refurbished second-hand laptop computers and its founders were keen to fulfill an ambition of entrepreneurship – a dream shared by many young Chinese people at that time). I agreed and she spent 6 months working with and documenting the progress of this start-up in Beijing which, at the time, comprised just three people. When she returned to the UK she provided me with a video documentary, subtitled in English, which provided a rare insight into this new company and the way they worked with their customers. Having spent quite some time living and working around the MIT campus I was struck by how similar the young entrepreneurs in Beijing were to those in Cambridge, Mass. 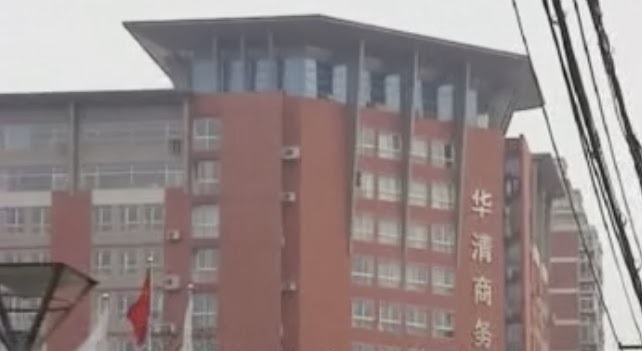 They started their business while still students at Tsinghua University and when it grew too large to run from the campus they moved across the road into a building where they could rent just enough floor space and communications for their needs. 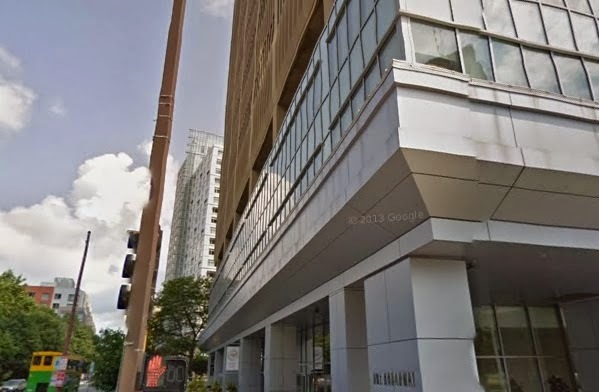 This was very much like the "Cambridge Innovation Centre" opposite the MIT business school at No1 Broadway, ( strap line-More Startups Than Anywhere Else On The Planet). The study of the Chinese entrepreneurs provided real insight and understanding of the culture of the young chinese coming out of their best universities and I have to admit was something of a wake up call at the time. 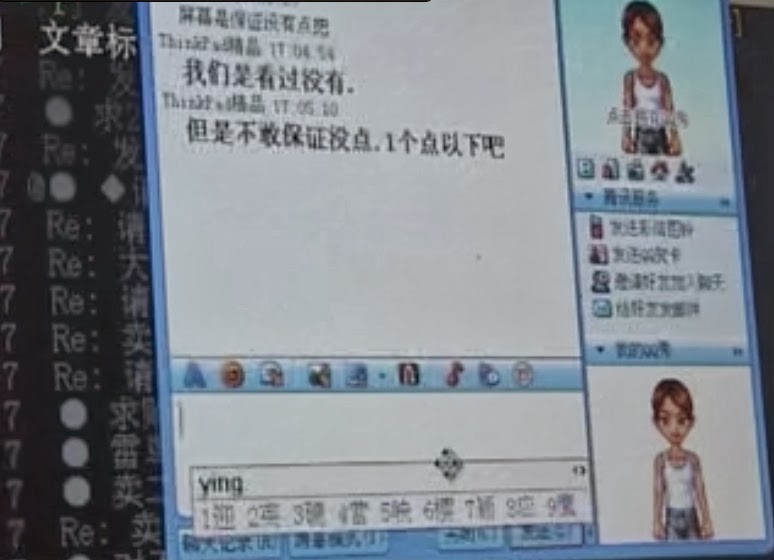 A secondary piece of insight which again surprised me was the speed at which the people in the company could communicate with their customers, using a combination of Instant Messaging and Pinyin, where the IM system quickly converted the typed Pinyin into Chinese characters for the opposite party to read. Between 2006 and 2008 I worked with a remarkable young social scientist based at Victoria University Melbourne Australia, Natasha Dwyer. * Dwyer, N (2008), Research Report: Towards Trust-Enabling Technology, Traces of Trust. Her opening paragraph: "Human communication consists of a wide range of verbal and nonverbal cues. Nonverbal cues can communicate intent, meaning and subtleties and have an intrinsic value. While digital technologies have dramatically enhanced the amount of opportunities of individuals to interact over space and time, these technologies do not contain this rich world of data people receive in the ‘physical world’ to help them make their decision. Thus when people make a trust assessment in the digital space they are not privy to the usual contextual cues used to interpret information." * Dwyer, N (2006), Research Report: Trust and the Young Digital User: The Significance of the Trustee’s Intention, Motivation and the Gift Exchange Process. In this paper she makes these key points: "As the ‘early-adopters of technology’, young people (16 -25 year olds) are defining how technology is understood in our society. New ways of gathering, critiquing and retaining information are being established ~ the ‘web generation’, the first generation to grow up digital, take on ‘new technology’ ~ these value systems regarding digital communication affect how the participants perceive trust, relationships and exchanges in the digital domain." Her examination of trust and privacy in the environments enabled by new technologies was quite groundbreaking and allowed me to really understand the nature of trust in our 'always on' new world and how this new generation of people who have 'grown up digital' perceive our world. 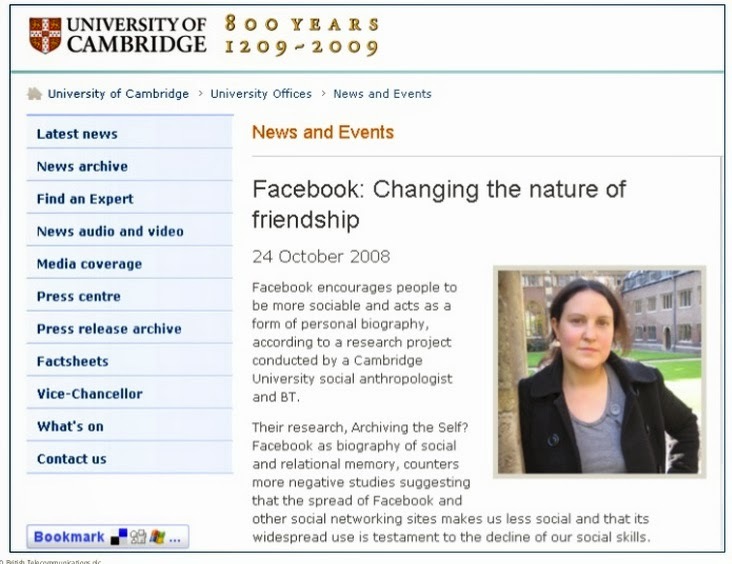 In 2008, after noting how quickly Facebook uptake was increasing, I arranged for a social anthropologist at Cambridge, Kathleen Richardson, to lead on a short research project looking at how Facebook might encourage people to be more sociable and to act as a form of personal biography. Additionally she examined the nature of 'friends' on social networks and how these differ from conventional friendships. She worked with a British Telecom social anthropologist, Sue Hessey and together they produced a paper; "Archiving the self? Facebook as a biography of social and relational memory", which was published in the Journal of Information, Communication and Ethics in Society. A key finding was that social networking sites can bolster past and weaker tie relationships as well as strengthen stronger tie ones. They also found that there appeared to be 'rules' developing around Facebook use, for instance, people had to have met a Facebook friend at least once physically before they were accepted as a friend on the social network. Another interesting finding was that participants rarely interact with the majority of their Facebook friends and "it is this dormant archive of relationships that hold the most interest as it provides an archive of relationships that would have dissipated without these technologies". Again social scientists had provided real insight into how people interact with new technologies. Since 2008 I have worked closely with many social scientists across a multitude of disciplines and their knowledge and insight has allowed me both to understand the impact of modern technologies and to help teams to design better technological solutions for people. Recently two global research initiatives have demonstrated the strategic value of this type of work. July 2011: "Culture, Communication and Change: An investigation of the use and impact of modern media and technology in our lives". The research project, led from the UK, was carried out in collaboration with teams in the US, China and Australia and it provided a unique view of how people are using communications technology in their lives at home and at work, whether young or old. It was covered in more than 200 media articles globally including slots on BBC Breakfast and BBC News at 6. November 2013: "Conversations, Conferencing and Collaboration: An International Investigation of Factors Influencing the Effectiveness of Distributed Meetings"
Modern conferencing technology makes it easy to have meetings with internationally distributed teams at any time, anywhere. These meetings can reduce both travel time and cost, however it is matter of some debate whether these meetings can be as effective as meetings held face-to-face. This report examines the phenomenon in teams from the UK, US, Australia and China and produces recommendations on how these meetings can be more effective. Social scientists are able to provide a unique and extremely valuable insight into how people live their lives and interact with the continually changing landscape of technology. They can also show us how our human relationships are changed by technologies, for example our friendships on social networks. But they can also provide us with insight into bigger global phenomena such as how trust and privacy are perceived, something which in this digital age is of great importance to everyone.